Juliusz Słowacki (1809-1849) was a great Polish poet of the period of romanticism. The rank of Słowacki in Polish culture is best reflected by the fact that (being not a royalty) he was honoured with a burial in the royal cathedral in Cracow, among the tombs of the kings of Poland. In his short life he once (1836-37) travelled to the Near East including Egypt. He wrote a number of poems being reminiscences of that journey. The lecturer would like to share with the audience a few observations on the reception of ancient Egypt by a Polish intellectual of the early 19th century. Adam Łukaszewicz is professor of archaeology, papyrology and ancient history at the University of Warsaw. As a fellow of the Alexander von Humboldt Foundaton he carried out research at the University of Marburg. He is also an alumnus of the Institute for Advanced Study in Princeton. He is Vice-Chairman of the Committee for the Study of Ancient Culture of the Polish Academy of Sciences. 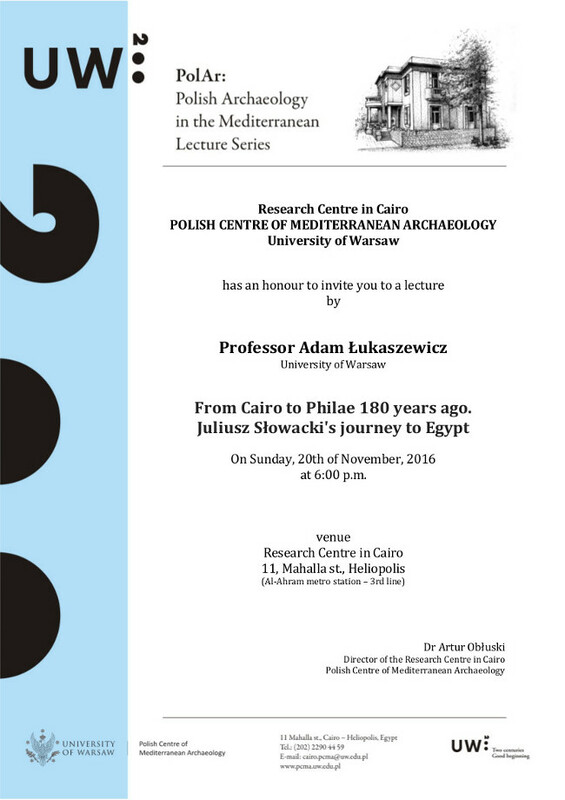 His research in Egypt with the PCMA and the Foundation for Polish Science is concentrated on Alexandria and on the Valley of the Kings.